The latest book by Naomi Klein is essentially a call to share the world’s resources, but its thesis on social transformation is missing a crucial factor: a profound awareness of the reality of hunger and life-threatening deprivation. While Pope Francis’ recent encyclical calls on us to prioritise this global emergency in our efforts to combat global warming, Mohammed Mesbahi proposes a people’s strategy for how we can finally end the moral outrage of extreme poverty amidst plenty. Climate change is an historic opportunity to not only heal the environment, but also to roll back the tide of injustice and ever-widening inequality that is an integral feature of our current economic system. It represents our greatest hope of solving multiple, overlapping crises at the same time; of spreading wealth, resources and political power from the few to the many; of unleashing our suppressed human values of empathy and solidarity on a global scale; and of creating a “People’s Shock” that reinvigorates democracy from the ground up. Rising to the climate challenge could also be the force – the “grand push” – that brings together all the living movements for justice and liberation, catalysing enormous levels of social mobilisation across the world and bringing about a major shift in the balance of economic power. Such is the compelling message of Naomi Klein’s latest book, This Changes Everything, that deservedly hit the best-seller lists last year. The book is, essentially, an urgent call for sharing the world’s resources (including the atmosphere itself) on the basis of justice and equity, which Klein recognises is the only viable route to creating a stable climate while also building a fairer economy. The farsighted optimism that underpins her book has been predictably dismissed by right-leaning critics, many of who have mocked its framing of “capitalism vs. the climate”, or else argued against its radical policy proposals and the prospect of deep systemic change driven by an engaged citizenry. But even from the most sympathetic and progressive perspective, is it possible that Klein’s analysis is broadly right on the politics and right on the solutions, but incomplete in terms of an overarching strategy for how to get there? Is there something missing from the book’s thesis that calls into question its vision of how to engage the world’s people behind a program to ‘change everything’? To briefly summarise Klein’s core argument further, it is premised on the understanding that to avoid a 2-degrees Celsius increase in global average temperature - the supposed “safe” limit of climate change according to the United Nations – revolutionary levels of transformation of the political and economic system are necessary. The challenge that faces humanity is momentous and daunting, requiring a dramatic decrease in fossil fuel combustion and our use of the earth’s resources, particularly in the richest countries with the highest levels of consumption. Yet the intensification of neoliberal globalisation since the 1980s has “systematically sabotaged our collective response to climate change”, which is a threat that came knocking just when the ideology of free trade and mass privatisation was reaching its zenith. As a result, the changes needed to avoid catastrophic warming are now in conflict with the fundamental imperative at the heart of our current economic model – to “grow or die”. And the challenge isn’t just to spend more money on the problem and change a lot of policies; it’s to completely rethink our relationship to each other and the natural world, to go beyond our dominant “extractivist” worldview and neoliberal mindset, and to embrace a new global understanding of our common humanity. This is where Klein’s strategy for mass civic engagement comes into play, given the entrenched opposition to the necessary structural transformations from the established corporate and political class. The only way to overcome the prevailing ideology of market fundamentalism and bury the “corporate liberation project” of the past three and half decades for good, Klein basically argues, is through robust social movements unlike anything we have seen before. And climate change represents the “civilisational wake-up call” that can unleash our repressed human values for deep compassion, empathy and solidarity on a global scale, thus giving us a chance for a “mass jailbreak” from the house that the old free market ideology built. The fourth chapter of the book explores the nature and purpose of this new wave of citizens’ movements in more detail, describing climate change as a frame and not an “issue”, one that can breathe new life into longstanding political goals and supercharge each one of them “with existential urgency”. Climate science, Klein writes, has handed progressive groups and activists the most powerful argument against unfettered capitalism since the very onset of industrialisation. Acknowledging that the call for “System change, not climate change” already exists within the environmental movement, Klein goes further by envisioning the climate crisis as a political game-changer and unifier of all disparate issues and movements – from the fight for a new economy, new energy system and new democracy, to the fight for human rights and dignity for all. In short, she argues that activists need to become ‘everyone’ if we are to stand a chance of dramatically reducing global carbon emissions, and doing so in a way that alleviates poverty and inequality at the same time. This captivating theory of social change is backed up throughout the book by a fairly comprehensive overview of the policies that are needed to meet these twin challenges of tackling climate change and inequality. And implicit in all of these policy transformations, as Klein repeatedly articulates, is the need to integrate the principle of sharing into national and global governance through a redistribution of wealth and resources. The environment crisis is “telling us that we need an entirely new economic model and a new way of sharing this planet”, she writes, central to which is the matter of ‘global equity’ that is ever-present in climate negotiations. Drawing on the thinking of various civil society activists and scholars, the book therefore advocates for a “Marshall Plan for the Earth”, in which Western powers accept their fair share of the global carbon-cutting burden as well as their historical climate debt to the Global South. In line with this proposed international agenda, Klein outlines the major policy and social changes that affluent nations need to commit to in order to reduce their use of material resources - what is described as “managed degrowth” - in ways that improve quality of life overall. Hence the need for a reinvigorated role for the public sector, shorter working hours, a basic income guarantee, the relocalisation of our economies, and the many tax and subsidy reforms that could “finance a Great Transition (and avoid a Great Depression)”. Klein even invokes the slogans of 1940s wartime rationing programs that were based on themes of equality and fairness, such as “Fair shares for all” and “Share and share alike”, arguing that a spirit of moderation and sacrifice for the greater good has a strong precedent in America’s past cultural values. The problem, as Klein makes palpably clear throughout her book, is that these measures we must take to secure a just and sustainable transition away from fossil fuels clash with the reigning economic orthodoxy on every level. Such a shift breaks all the ideological rules of free market capitalism, requiring visionary long-term planning, tougher business regulations, higher levels of taxation on the affluent, many reversals of core privatizations, a decentralisation of power to communities, and so on. Which all leads back to the original question: how to instigate the kind of counterpower that has a chance of changing society on anything close to the scale required. If “only mass social movements can save us now”, as Klein rightly suggests, then what can rouse ordinary people to fill the vacuum in political leadership – given that such a citizens movement of sufficient numbers is still missing on the world stage (as Klein also rightly acknowledges)? Is climate change the single, overarching issue that can bring about a profound shift in values and galvanise the world’s people towards a shared planetary cause? From the perspective of Share The World’s Resources (STWR), what’s missing from Klein’s analysis in her current work on climate change is a profound awareness of the reality of hunger and life-threatening deprivation across the world, and of the consequent moral imperative to prioritise this global emergency as a foremost priority for the world’s governments. Just as a massive mobilisation of ordinary citizens is necessary to persuade our political representatives to push through the policies that can limit global warming, exceptional levels of popular engagement are also necessary to influence governments to end the moral outrage of needless poverty-related deaths in a world of plenty. And that huge avoidable death toll continues as each day passes – to the extent that at least 17 million people die each year in mainly low- and middle-income countries from largely preventable causes (half of them children and often from diseases related to hunger). As STWR and other civil society organisations have long pointed out, governments already have the institutions and mechanisms in place to safeguard these neglected human lives across the world, and providing social protection to all people living in extreme poverty could be achieved with a relatively small amount of global GDP. But there exists a stark lack of public debate about the extent of this ongoing crisis, and the urgency of ensuring that everyone has access to sufficient food, clean water, adequate shelter and medical care – the essential resources that most people in affluent countries take for granted. 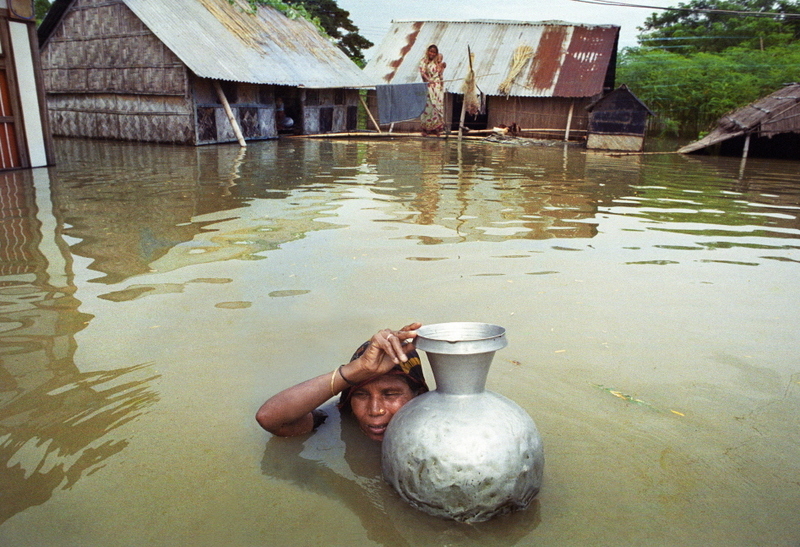 Climate change is indeed a planetary emergency; but needless poverty-related deaths constitute a global emergency too, one that will require an immense awakening of public concern if this longstanding crisis is to be addressed with the level of attention it has always deserved. To be sure, Naomi Klein’s book is fundamentally concerned with how to bring about a more equal economic order, and her noble conviction that governments must equitably share the global carbon-cutting burden is entirely informed by the needs of poorer countries. In her own words, she writes that “poverty amidst plenty is unconscionable”, and “there is simply no credible way forward that does not involve redressing the real roots of poverty”. But nowhere in the book is there an impassioned plea for ordinary people to rise up and demand that governments irrevocably end hunger and life-threatening conditions of deprivation wherever it occurs in the world, and as an international priority above all other priorities. Without this heartfelt concern for the immediate needs of the very poorest people in mostly developing countries, Klein’s case for using the language of morality to build a global citizens movement for saving the planet - with everyone together speaking “of right and wrong, of love and indignation” - in the end rings hollow. For what does it mean to have “an unshakeable belief in the equal rights of all people and a capacity for deep compassion”, if there’s no focus on the preponderance of people in the world who lack the resources to even have an adequate standard of living? What does it mean to talk of “the need to assert the intrinsic value of life”, if there is no mentioning of the roughly 46,000 people who needlessly die each day from deprivation or deprivation–exacerbated disease? So Klein may be right on all other counts: on the need to fight inequality on every front through multiple means as a central strategy in the battle against climate change. On the need to rebuild and reinvent “the very idea of the collective, the communal, the commons, the civil, and the civic after so many decades of attack and neglect”. And on the need to create a robust alliance of social movements who embrace a new worldview which is embedded in our shared values of interdependency, reciprocity and cooperation, as well as in our awareness and respect of nature’s limits. But if this emerging movement is to “find its full moral voice on the world stage”, as Klein says it must, then is it enough for that movement to focus only on climate-related battles, new economic alternatives and the longer term structural changes required for building a fairer economy (with a definite bias towards the benefits of implementing such changes within North America and other high-income world regions)? Or should it also embrace the immediate needs of a vast number of impoverished humanity, many thousands of who are at risk of dying from hunger or deprivation-related causes at this very moment? As we know, climate change already causes 400,000 deaths on average each year, mainly due to hunger and communicable diseases that affect above all children in developing countries. Addressing the underlying causes of these escalating climate and poverty crises will undoubtedly necessitate structural reforms on a scale never before attempted by the international community. On moral grounds alone, however, we cannot wait for these transformative changes to take place while millions of people are losing their lives and suffering in abject poverty, especially when everything needed to mitigate the worst impacts of this emergency already exists. Remarkably, the Catholic Church is currently leading the way in presenting a powerful moral case for why we must combat both the climate and poverty emergencies at the same time. Pope Francis’ much-anticipated Encyclical Letter Laudato Si’ makes a direct appeal throughout its 246 paragraphs for us to give “preferential treatment” to the most deprived members of the human family, and to “hear both the cry of the earth and the cry of the poor”. This is not to overlook the striking similarities between Laudato Si’ and Klein’s overall perspective on how climate change cannot be tackled without also tackling global inequality. As Klein alluded to in her speech delivered at the Vatican during the recent high-level meeting that explored the climate crisis, the Encyclical effectively calls for a more equitable international economy that respects planetary boundaries, while giving full support to all the radical policy measures that these changes imply. Indeed many of the policy positions outlined in the Encyclical are also advocated for in Klein’s book, from degrowth economics and limits on consumption and growth, to agroecology, fossil fuel divestment, technology transfers and the repayment of ecological debts, as well as the repudiation of false solutions like carbon trading. What’s just as remarkable about the Pope’s treatise on the environment, however, is the fact that as much attention is given to the shameful reality of global poverty as to the politics or science of climate change. The real import of the Encyclical’s message is not to be found in its uncompromising policy perspectives or its scathing critique of market fundamentalism, but rather in its urgent appeal for humanity to protect the most vulnerable, who are the “majority of the planet’s population” and yet treated “as an afterthought” in international political and economic discussions, if not “treated merely as collateral damage”. The Pope fervently calls upon Catholics and non-believers alike to engage in a global conversation about how to create “a new and universal solidarity” in meeting our environmental challenges, in which our ecological concerns are “joined to a sincere love for our fellow human beings”. Perhaps it’s only from this appeal to our compassion and empathy for others that we can fully appreciate the Encyclical’s wider political, economic and ecological perspectives. To try and condense it’s essential message in a few words, it could be interpreted as saying that we need a new collective understanding that “we are one single human family” and “one people living in a common home”, which in the end has to be translated into global solutions for our interconnected planetary crises – beginning with concerted international action to alleviate the suffering of the world’s majority poor. And it’s this very last proposition that represents, in essence, the missing part of Naomi Klein’s analysis. As the Encyclical Letter again states: “Whether believers or not, we are agreed today that the earth is essentially a shared inheritance, whose fruits are meant to benefit everyone. …Hence every ecological approach needs to incorporate a social perspective which takes into account the fundamental rights of the poor and the underprivileged.” But what would a people’s strategy for saving our planet look like that heeded this simple message to prioritise the needs of those who “are mired in desperate and degrading poverty, with no way out” - bearing in mind the Pope’s insistence that his Letter is a social teaching and not a political manifesto? How could Klein’s inspiring vision of an empowered global citizenry be infused with the right priorities for popular protest, wherein a massive outpouring of public goodwill towards the most deprived and marginalised people becomes the catalyst for world transformation? And what might instigate such an unprecedented show of global solidarity towards the needs of those less fortunate than ourselves, thereby uniting ordinary people in many different countries and creating a consensus about the necessary direction of change? These neglected and yet urgent questions form the starting point of our analysis at STWR, and they lead to an uncommon theory of social change that is often outside the purview of well-known progressive thinkers. Rather than beginning with the question of how to reorganise society and implement a greener and fairer economic alternative (which is typically conceived within the context of rich industrialised nations), the question is how to completely reorder government priorities in order to provide the basics of life to everyone who subsists in a severe state of poverty – which should not be seen as an end in itself, but as a first major step towards world rescue and rehabilitation. Anyone can see that the requisite money and resources are available in the world to realise an adequate standard of living for all people, as long enshrined in Article 25 of the Universal Declaration of Human Rights. But nowhere are these essential requirements for life and dignity fulfilled for every man, woman and child without exception, including in the richest countries where social protection guarantees are increasingly being reneged upon through welfare reforms and austerity measures. As a consequence, there is no doubt that Article 25 will never be fully guaranteed by governments in all countries – whatever is agreed upon in the Sustainable Development Goals – unless ordinary people unite in their millions and uphold these fundamental rights through huge, continuous and worldwide protests. STWR’s founder Mohammed Mesbahi has comprehensively investigated these above premises in a recent publication, setting out a visionary strategy for world transformation that calls on people of goodwill to herald Article 25 as their foremost concern in the immediate time ahead. In contradistinction to Naomi Klein’s call to mobilise public opinion around a systemic approach to tackling climate change, Mesbahi argues that securing the modest provisions outlined in Article 25 - for adequate food, housing, healthcare and social security for all – ultimately holds the key to resolving our complex interrelated crises. He posits that we can never tackle the climate emergency without first of all remedying the injustice of poverty amidst plenty, because resolving the human emergency of life-threatening deprivation is where the solution to our wider ecological problems initially begins. Drawing on moral and spiritual perspectives that often resonate with Pope Francis’ social teaching in Laudato Si’, Mesbahi goes on to explore at some length why “it doesn’t make any sense to fight for the rights of Mother Earth, if in the meantime we overlook the basic rights of a vast number of impoverished humanity”. Such a simple call to action for the world’s people may seem at odds with the vision outlined in Naomi Klein’s latest book, although Mesbahi also makes plain that it’s not an ‘either/or’ proposition in terms of prioritising the poverty emergency above everything else. On solely moral grounds, he writes that “there is no reason why we cannot save the hungry at the same time as we act to save our world”. If we can mobilise ourselves globally to try and persuade our governments to halt environmental destruction or even to stop an illegal war, then why can’t we organise huge international protests that are united in the cause of implementing Article 25? The reason why we don’t do so should be a question that preoccupies all of us, not least considering the interconnections between our social and environmental crises that make it compulsory to tackle both of these emergencies simultaneously. To join vast numbers of people in the streets calling for the abolition of hunger and extreme poverty is very different from demanding government action on climate change, says Mesbahi, because the former venture would represent “the beginning of a transformation in our conscious awareness that is based on our compassion for those less fortunate than ourselves”. Yet the prospect of initiating global demonstrations on this basis is not just a matter of straightforward morality, as it may also pose the only viable strategy for creating a global movement of massed goodwill that is stronger than any vested interest or repressive government. From a purely tactical perspective, another important question for every engaged citizen to ponder is whether our fear of future environmental breakdown is a sufficient motivating factor for bringing together many millions if not billions of people in different continents for the same cause. After all, an astonishing 4.3 billion people presently subsist on less than $5-a-day, the threshold that the UN body UNCTAD consider the minimum daily income which could reasonably be regarded as fulfilling Article 25. And among this multitude of ‘have-nots’, the true number of people suffering from hunger and vitamin deficiencies in developing countries could be upwards of 2 billion. In contrast, only 7% of the world population lives on a ‘high’ income level of more than $50 per day, most of who live in North America and Western Europe. Such statistics need only be brought to life in our imaginations to realise the stark discrepancies in living standards between the richest and poorest regions of the world. Thus without first prioritising every person’s established right to access the essential resources required for their health and wellbeing, there is little hope that the struggling poor majority will join forces with far more privileged climate activists in high-income countries in a cooperative bid to protect the planet. Herein lies the beauty and promise of heralding Article 25, as Mesbahi explores from psychological and spiritual as well as broader economic and political perspectives. The surest route to transforming the world is not to fight against ‘capitalism’ or ‘the system’, he reasons, but to jointly speak out in defence of our most disadvantaged and hungry brethren. And heralding Article 25 holds the potential to unite millions of people across every continent without the energy of being ‘against’ any enemy or ideology, which could create a new wave of social movements that bring “such inspiration and joy to onlookers that millions of more people will soon join in”. Very quickly, word would spread around the world of these extraordinary protest actions that are motivated by the public’s determination to end all forms of extreme human deprivation as an overriding international priority. There is no doubt that the majority poor in distant countries would soon hear the call and get involved themselves, which Mesbahi proposes is the fastest way to build a colossal worldwide movement of ordinary engaged citizens. It is therefore the “path of least resistance”, he writes, one that may “quickly lead to many positive results and a new social settlement that we cannot currently anticipate”. Of course, this doesn’t mean that rapidly meeting the basic needs of the poorer two thirds of humanity will in itself create an alternative to globalised hyper-capitalism, or somehow miraculously reverse the world’s currently disastrous environmental trends. But if governments are seriously compelled by the people’s will to prioritise the modest prescriptions contained in Article 25, then there is no gainsaying the positive ramifications for international relations and global economic arrangements. In a short period of time, concerted action to guarantee Article 25 everywhere would necessitate extensive state interventions and regulations that could hold in check the overriding influence within society of profit, greed and unbridled market forces. It would intrinsically call “for redistribution of a breadth and scale unlike anything we have seen or known before”, thus incorporating the principle of sharing into world affairs through an emergency programme to end hunger and absolute poverty once and for all, no matter what the cost. Furthermore, it would mean that the United Nations must be significantly democratised and re-empowered in order to fulfil its original mandate, while its member states would be obligated to reformulate the entire nature and purpose of development. There is no possibility of securing the socio-economic rights of all people until new global rules and institutions are established that can bring us closer to a more equal world. For example, the international community would need to abolish the unjust debts owed by developing countries, close down tax havens, roll back the tide of secretive free trade agreements, and put an end to structural adjustment programmes that enable rich countries to control the fates of less powerful nations. And in the process of fulfilling this unparalleled objective, governments may soon realise in practice the benefits of genuine international cooperation, which in turn may engender the trust and goodwill that is vital for resolving the other looming threats to human civilisation: namely, the continued drive for war and unchecked atmospheric pollution. In other words, heralding Article 25 as the public’s self-appointed decree is a direct approach to overcoming the prevailing ideology of market fundamentalism and neoliberal globalisation, which Klein has also consummately identified as the basic underlying cause of runaway climate change. More than this, however, it may be the only route to rallying masses of people, both rich and poor, behind an informed and shared aspiration for a fairer distribution of global resources. There is no question that the poorer two thirds of humanity, those crying out for help and succour and a better way of life, will embrace such an altruistic and inclusive demand. The real question is whether a critical mass of people in more affluent countries – the comparative minority of the global population who over-consume and waste the majority of global resources – will uphold and champion the principle of sharing in response to world need. Perhaps only then can we foresee the implementation of a sustainable development pathway for the world, regardless of the opposition of powerful elites and the myopia of global decision-makers. And perhaps this is the only way to bring about the shift in cultural values that Klein stirringly articulates, in which we start to believe, once again, that “humanity is not hopelessly selfish and greedy” and our planet is worth saving. Through a worldwide popular movement that demands an end to poverty as its all-embracing cause, it would soon become obvious that we can never live peacefully or ‘well’ so long as the greater proportion of humanity lives in penury and degradation. Then there is every hope of changing public attitudes in rich countries to accept reductions in material and non-renewable energy use, in line with the kind of global framework for equitably cutting carbon emissions that Klein outlines towards the end of her book. There is no shortage of analysis pointing out the basic premises for a more balanced society, whereby a new era of simplicity is inaugurated based on a revised understanding of what constitutes the ‘good life’, with reduced resource consumption and more frugal living commonly prized as the social ideal. Clearly, high-income nations must lead the way if more realistic standards of living are to become aspirational for the Global South. What remains unknown is how this collective shift in our worldview can be decisively brought about, one that really speaks the language of morality and willingly accepts the responsibility for shared sacrifice as we transition to a new economy. The answer, according to Mesbahi’s reasoning, is to “listen to the voice of our own hearts” and herald Article 25 with every ounce of energy we have. Or put another way, the entire process of world rehabilitation may only begin with a united people’s voice that speaks on behalf of the poorest and most disenfranchised, and gives the highest priority to the elimination of extreme deprivation and needless poverty-related deaths. The above points are a highly condensed summary of Mesbahi’s rationale from his latest publication, which contains further instructions for global activism that deserve to be carefully read in full before we come to any conclusions about the immense potential of resurrecting Article 25 as our protest slogan, goal and vision. He urges that we all have a part to play in this great civilisational endeavour to urgently defend the human rights of our neediest brothers and sisters, while at the same time we must act to save our planet and urgently defend the rights of Mother Earth. In this regard, the key to understanding Mesbahi’s strategy for galvanising a vast transnational public opinion of sufficient magnitude to reorder government priorities is to study the fourth chapter of his discourse on “engaging the heart”, wherein he explains the crucial significance of this absent protagonist on the world stage. Can we foresee popular demonstrations that are infused with an awareness and heartfelt concern for the degrading poverty that is experienced by innumerable families and marginalised individuals, in the same way that our hearts are engaged to look after our children, protect our own families or indeed care for the natural world? No matter how testing this may sound of our everyday sympathies and concerns, it assumes nothing more than redirecting public attention towards immediate human need, which is far from an attempt to satisfy some vague or idealistic theory of global revolution. Yet according to Mesbahi, this is the factor that most activists and progressive thinkers have failed to recognise as a prerequisite for planetary healing and transformation: the engagement of the hearts of millions of people in every country through peaceful mass protests that are concerned with a permanent end to avoidable human suffering. It may appear that there’s still a long way to go before we can realise a truly global citizens movement committed to sharing and conserving the world’s resources, with the primary consideration given to the least privileged among us. But perhaps the reason this countervailing ‘new superpower’ hasn’t fully emerged is because we have yet to collectively apply Mesbahi’s question to ourselves, let alone to our global leaders: where’s the missing part?